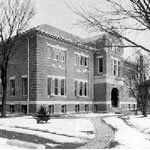 Physics at Purdue has a long and rich history dating from the latter part of the 19th century, with participation by illustrious physicists from all corners of the world and spanning all fields of the subject. The following links provide a window into the rich past of our department. Interview with Anna Akeley for a first-hand account of the Physics Department during the 1940s, 50s and 60s. History of semiconductor research at Purdue Ralph Bray describes his almost 50 year tenure here. A biographical study of Karl Lark-Horovitz the man who transformed physics at Purdue from a service-oriented activity to a first-rate research effort. The Early Years (1874-1928) a comprehensive history of the Purdue Physics Department in the early years by Gartenhaus, Tubis, and Cassidy. James, Placzek, Lark-Horovitz, and Korff. Early Lark-Horovitz Era (1928-1942) another comprehensive history of the Department in the early years of Lark-Horovitz by Gartenhaus, Tubis, and Cassidy. The War Period (1941-1945) third installment in the history of the Department, during the war years, by Gartenhaus, Tubis, Cassidy, and Bray. The Post-War Years (1945-1958) fourth installment in the history of the Department, during the post-war years, by Bray, Gartenhaus, Tubis, and Cassidy.